The Cumberland Society of Chartered Accountants held a Quiz night in Foxy’s Restaurant, Carlisle on Friday 16 May 2014. The overall winners on the evening were the team from David Allen, Chartered Accountants (pictured). Congratulations to the winning team that was (left to right) Mark James, Melanie Thomson, Hannah Jackson, Leanne Tickle, Julie Osborn and Vicky Johnston. Quiz Masters Lisa Murchie (Chairman) and Charlotte Richardson (Vice-Chairman) went through 10 rounds of questions to see which local accountants would come out on top. This was a great networking opportunity that allowed members from various local firms to test their general knowledge. The joint event was held with Cumberland Chartered Accountant Students’ Society. 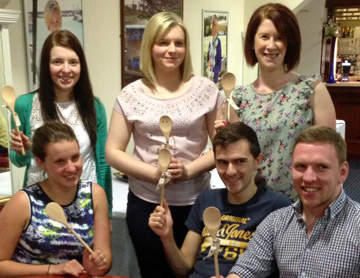 Also pictured are the team from Armstrong Watson who won the wooden spoons!